What’s the problem with natural weathering? It’s a sign that the outdoor decking is rather old and most likely requires some maintenance. (It always depends on the wood type and the extent it is exposed to the sun, rain etc.). With that said, it’s often preferable to treat deck to get the desired weathered looks. 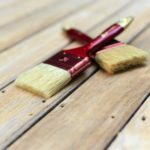 One solution is to paint the existing deck – as long as it’s in a good condition – to create the washed look. This is often accomplished with a gray shade that will cover and thus protect the surface but will be transparent enough to create the impression of a weathered deck. The second solution is to paint the new deck to create a washed appearance. But you need to ask your deck contractor which timber to choose. Not all wood species have the same color. That makes sense. Doesn’t it? 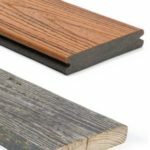 Which wood deck to choose for weathered looks? Hardwoods are the best choice. Why? Because they get greyish over the years. But a cedar outdoor decking will also do. This might be a softwood but one of the strongest ones and also has a warm color. Cypress also gets gray when it ages and it’s charming. In spite of the treatment they need after deck building and before installation, hardwoods and some softwoods are excellent solutions for your porch or the area around the pool. The idea here is not just to get the weathered appearance but also a trusted deck that won’t rot, split, or become damaged a few years later. Now, the fact that some woods gray off overtime makes weathering easy. Why? Because you will already have the base to work on. But don’t forget to maintain it by sanding the surface or perhaps nailing some boards to make sure it is safe too. Weathered deck? Good! Weather them even more! What’s the whole idea? While everyone else would try to maintain their weathered cedar, ipe, or pressure treated decking to look like new, you will move to the opposite direction. You will try to make a new or old deck look weathered. It will have the elegance of the old without its disadvantages. Bear with me since I need to make a distinction here between weathered and washed. The former refers to the look that resembles old. Since most naturally weathered decks get a grayish color, you should paint yours a silver-gray too. On the other hand, washed means having a mixture or splashes (if you will) of two or three colors on one surface giving the impression that the material is old and weathered. We often talk about white-washing. 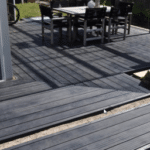 The new outdoor deck trend now is grey-washing. The simplest appearance will be to paint it and leave some areas free of paint in order to see the wood grain underneath. A similar way to achieve this look? Sand wood first to make sure the surface is smooth. Use a foam brush to apply the stain you selected to provide the undertone. Once it’s (almost) dry, wipe the excess off. Choose a deck paint in the gray shade you like and apply on the surface. Sand here and there to let the first paint reappear and thus have a two-color deck. If you lack the time or skills to create patina yourself, ask deck companies to offer distress wood options. That’s perhaps the best solution to all those who wouldn’t mind getting a new outdoor wooden decking.